The internet has become such a great tool not just for chefs but for everyone. The net has given everyone the tools to see and almost experience new and different ideas. I do the cooking at home. Where we eat no more than 100 grams of meat a day and have ‘tons’ of fresh vegetables. I prepare the vegetables with a wide range of herbs, spices and such. We also keep on hand lots of fruit, yogurt and great breads. All my jobs have been with food in one way or another since 1948. My parents were in the hotel business, and I just loved the warm hearted people who worked so hard with such good humor. Graham Kerr was born in London, England. He is an English chef, TV presenter, and writer who is best known for his 1969-1971 television cooking show The Galloping Gourmet. He was educated at the independent school Brighton College. He was General Manager of England's Royal Ascot Hotel. He moved to New Zealand in 1958, becoming chief chef catering adviser for the Royal New Zealand Air Force. In 1959, he began hosting the television show Entertaining With Kerr. 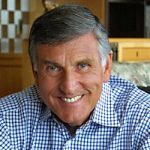 He has written several cookbooks include: Entertaining with Kerr, The Graham Kerr cookbook, The love feast, Graham Kerr's Smart Cooking, Graham Kerr's Minimax Cookbook, Graham Kerr's Creative Choices Cookbook, Graham Kerr's Kitchen, The Gathering Place, Substance in Shadow, Graham Kerr's Simply Splenda Cookbook, Recipe for Life, Day-by-Day Gourmet Cookbook, Growing at the Speed of Life, and Flash of Silver.